Final GHS Deadline for Mixture Hazard Warning Label & Safety Data Sheet compliance is 1st June 2017. The two-year grace period for mixtures will expire and from this date ALL substances and mixtures must be classified, packaged and labelled in accordance with the Classification, Labelling & Packaging (CLP) Regulations (including those in the supply chain) and they must also be accompanied by a Safety Data Sheet (SDS) which contains the appropriate classification of the mixture. Are you aware of the impact the CLP deadline has on your company? Do you have systems in place to comply with the Regulation? If not, NOW is the time to act to make sure that you are in full compliance before the deadline ends. Meeting labelling requirements is central to the GHS/CLP regulations and most companies have already made the necessary changes, however, if you haven’t yet converted your labels from the CHIP regulations (that followed the Dangerous Products Directive (DPD)) to CLP, then you must do so immediately. For assistance in complying with the new requirements, please contact a member of our sales team on 0113 242 4272. Safety Data Sheets play a prominent role in hazard communication and these will also be affected by the coming deadline. If you manufacture or supply chemical mixtures which contain hazardous substances, for professional or industrial use, then after the deadline, you must provide a CLP compliant Safety Data Sheet with your products. From 1st June 2017, SDSs must not include the CHIP/DPD classification – it must be completely removed. After the deadline, SDSs must only contain the CLP classification and they must follow the 16 chapter format with the hazard information, including the labelling information, shown in section 2. 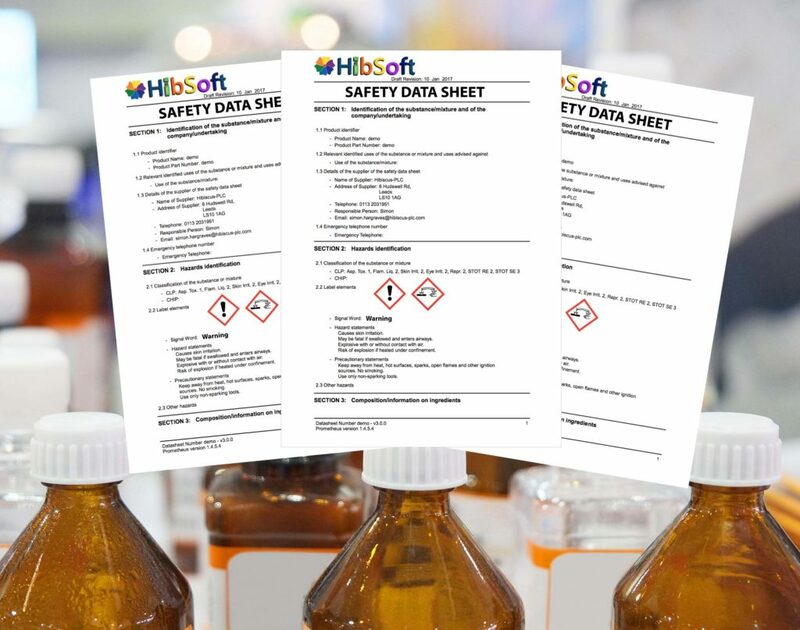 The contents of the Safety Data Sheet must match the information on the label of the mixture. I already have a Software/Label supplier, why should I talk to Hibiscus? Hibiscus has been producing specialised labels, for use in harsh environments, for over 35 years and our in-house team of programmers and developers have created a range of software to solve our customers’ dilemmas since 1986. Our custom-made solutions are exclusive to Hibiscus Plc and tailored specifically for hazardous goods labelling and documentation. Our unbeatable industry knowledge and experience ensures that our products are fully compliant with the latest regulations, easy to use, and able to produce exactly the results you need. Dangerous goods regulations can be a minefield and we pride ourselves on our expertise in compliance as well as the performance of our products in varying environments across the world. Created as a joint development with Lexeus Ltd, Prometheus is our Safety Data Sheet management software – a simple, intuitive and flexible solution for Safety Data Sheet compliance. Prometheus can be used independently as your ideal SDS creation, storage and distribution platform or combined with our companion products to form an integrated solution for all your hazardous chemical documentation and labelling requirements.